Introduction: To evaluate the feasibility of laparoscopic hepatectomy for patients with intrahepatic stones, we conducted a retrospective review of this approach performed in our institute. Laparoscopic management of the intrahepatic stones was challenging for the dilated bile duct with stones inside as well as the possible perihepatic adhesion after previous biliary tree infection. Additional common bile duct or contralateral intrahepatic bile duct exploration is necessary in some patients and makes the procedure more complex. However, the beneficial effects of minimally invasive hepatectomy will be expected when performed properly. Methods: From September 2006 to September 2009, total 8 patients received laparoscopic hepatectomy for hepatolithiasis in our institute. There were 5 male and 3 female patients with mean age of 53 years (41~71 y/o). 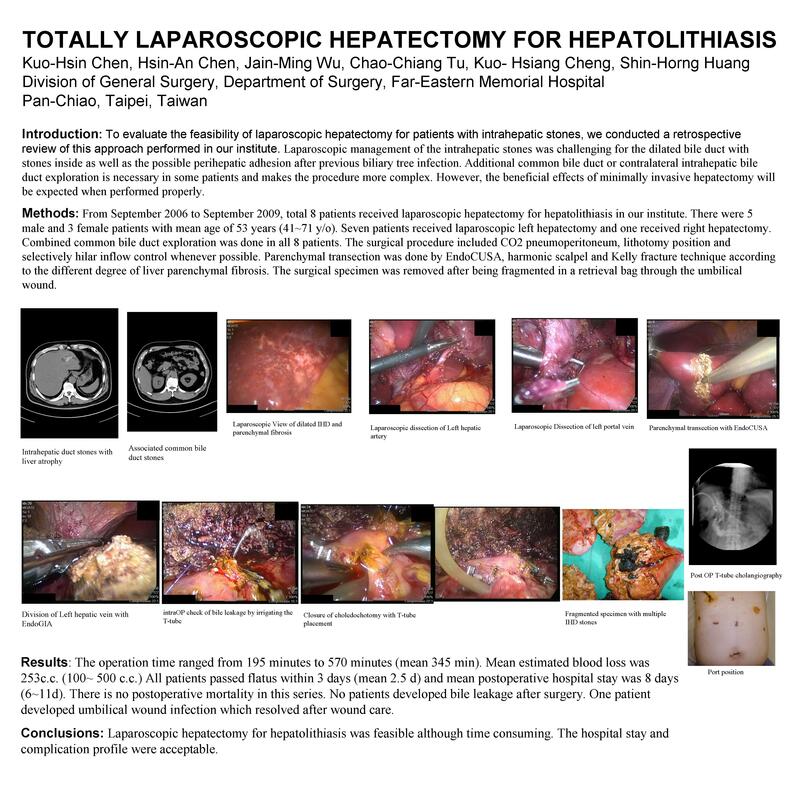 Seven patients received laparoscopic left hepatectomy and one received right hepatectomy. Combined common bile duct exploration was done in all 8 patients. The surgical procedure included CO2 pneumoperitoneum, lithotomy position and selectively hilar inflow control whenever possible. Parenchymal transection was done by EndoCUSA, harmonic scalpel and Kelly fracture technique according to the different degree of liver parenchymal fibrosis. The surgical specimen was removed after being fragmented in a retrieval bag through the umbilical wound. Results: The operation time ranged from 195 minutes to 570 minutes (mean 345 min). Mean estimated blood loss was 253c.c. (100~ 500 c.c.) All patients passed flatus within 3 days (mean 2.5 d) and mean postoperative hospital stay was 8 days (6~11d). There is no postoperative mortality in this series. No patients developed bile leakage after surgery. One patient developed umbilical wound infection which resolved after wound care. Conclusions: Laparoscopic hepatectomy for hepatolithiasis was feasible although time consuming. The hospital stay and complication profile were acceptable.